Neural spine bifurcation in sauropods, Part 5: is Haplocanthosaurus a juvenile of a known diplodocid? Last time around, Matt walked through a lot of the detailed cervical morphology of Suuwassea and known diplodocids to show that, contra the suggestion of Woodruff and Fowler (2012), Suuwassea is distinct and can’t be explained away as an ontogenomorph of a previously known genus. Just as particularly large diplodocid specimens (e.g., Seismosaurus; Gillette, 1991) have been more recently recognized as large and potentially older individuals of already recognized taxa (Diplodocus; Lucas et al., 2006; Lovelace et al., 2007), taxa deﬁned on small specimens (such as Suuwassea, but also potentially Barosaurus, Haplocanthosaurus, and ‘‘Brontodiplodocus’’), might represent immature forms of Diplodocus or Apatosaurus. Within Diplodocoidea (Dinosauria: Sauropoda), phylogenetic position of the three subclades Rebbachisauridae, Dicraeosauridae, and Diplodocidae is strongly influenced by a relatively small number of characters. As a statement of fact, this is simply the opposite of the truth: in all the major phylogenetic analyses, the arrangement of subclades with Diplodocoidea is the most stable part of the tree, supported by more characters than all the other clades. For example, in the analysis of Upchurch et al. (2004) in The Dinosauria II, fig. 13.18 shows that the nodes with the highest bootstrap percentages are Diplodocinae (96%), Dicraeosauridae (95%) and Diplodocidae (93%). * Why are the lists of apomorphies longer than the decay indexes? Because they list the apomorphies as they occur in the specific topology of the consensus tree. Nodes within that tree can be made to collapse without wiping out all the apomorphies by rejuggling other parts of the tree to move character-state transitions around. So although (for example) 26 characters separate Flagellicaudata from Rebbachisauridae (18 + 8 synapomorphies respectively) you can rejuggle the whole tree to break the monophyly of Flagellicaudata while making the entire tree only five steps longer. Anyway, for whatever reason, Woodruff and Fowler felt that the stability of the diplodocoid clades was in question, and this presumably influenced their hypothesis that Haplocanthosaurus could be easily moved down into one of the diplodocid genera. Pelves of diplodocids and Haplocanthosaurus. 1. Pelvis of Brontosaurus excelsus (No. 568); 2. Pelvis of Diplodocus carnegii (No. 94); 3. Pelvis of Haplocanthosaurus priscus (No. 572). All seen from left side. 1, 2, 3, 4, 5 indicate neural spines of respective sacral vertebra. Presumably to scale. Direct from Hatcher (1903:plate IV). Based on this, the pelvis of Haplocanthosaurus differs from those of the diplodocids in having a proportionally lower ilium, in the absence of the laterally facing rugosity on the posterodorsal margin of the ilium, in the very small distal expansion of the pubis and in the almost non-existent distal expansion of the ischium. These are all characters of the limb-girdle elements, which do not change greatly through ontogeny in sauropods. But the evidence from the sacral vertebrae is just as significant: the neural spines in the sacral area are less than half as tall as in the diplodocids — and this in an animal whose dorsal neural spines are conspicuously tall. The spines are also more anteroposteriorly elongate and plate-like. What’s more, sacral spines 1, 2 and 3 have fused into a single plate in Haplocanthosaurus, while the spine of S1 remains well separated from 2 and 3 in the diplodocids. So the ontogenetic hypothesis would have to say that the spine of S1 unfuses through ontogeny. Which is not something I’ve heard of happening in any sauropod, or indeed any animal. So the pelvis and sacrum seem distinct. But Woodruff and Fowler’s (2012) notion of ontogenetic synonymy is built on the idea that the differences in the cervical and dorsal vertebrae are ontogenetic. So let’s take a look at them. 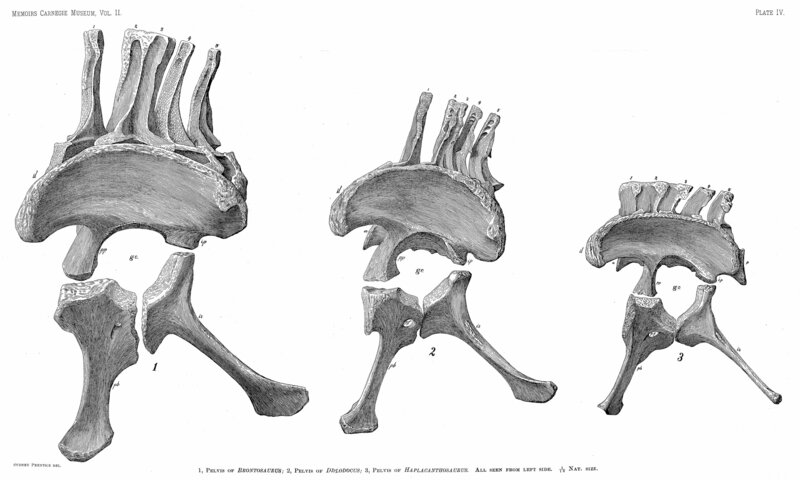 Posterior, mid and anterior cervical vertebrae, in right lateral view, of (top to bottom), Haplocanthosaurus, Apatosaurus louisae CM 3018 (from Gilmore 1936:plate XXIV, reversed for ease of comparison) and Diplodocus carnegii CM 84 (from Hatcher 1901:plate III), scaled to roughly the same size. For the diplodocids, we illustrate C13, C9 and C4. For Haplocanthosaurus, we illustrate C14 of H. priscus (from Hatcher 1903:plate I) and C9 and C4 of H. utterbacki (from plate II). It should be immediately apparent that the Haplocanthosaurus cervicals have less extensive pneumatic features than those of the diplodocids, but that is one feature which we know does vary ontogenetically. There are other differences: for example, the cervical ribs in Haplocanthosaurus are level with the bottom centrum rather than hanging below. Still, if you kind of squint a bit, you could probably persuade yourself that the Haplocanthus vertebrae look like possible juveniles of Diplodocus. 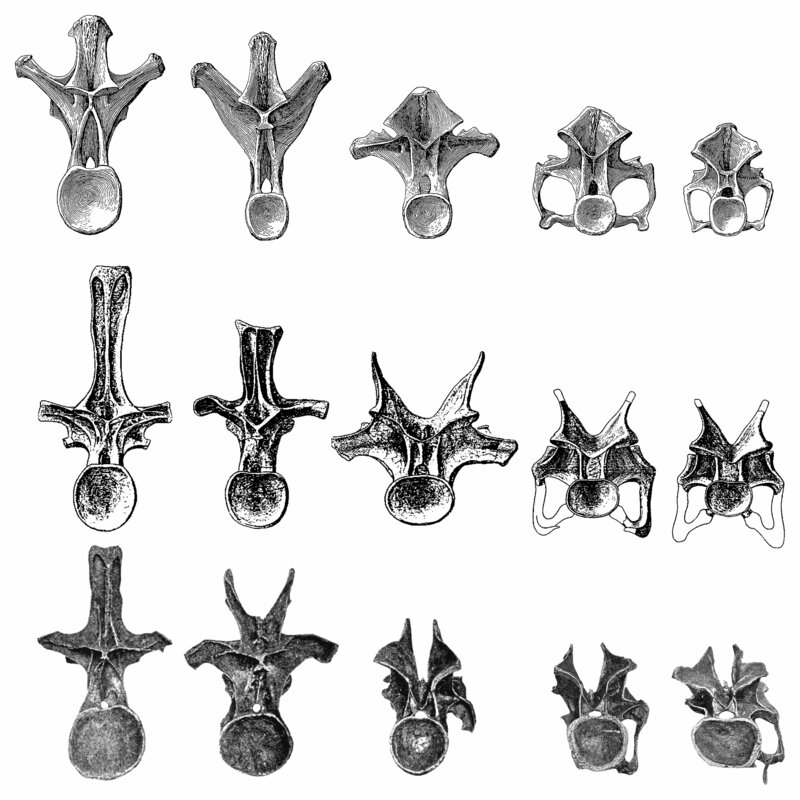 Posterior cervical vertebrae C15 and C14, in posterior view, of (top to bottom), Haplocanthosaurus priscus CM 572 (from Hatcher 1903:plate I), Apatosaurus louisae CM 3018 (from Gilmore 1936:plate XXIV) and Diplodocus carnegii CM 84 (from Hatcher 1901:plate III), scaled to the same centrum-to-neural-spine height. First, that unsplit spine. Yes, we know that Woodruff and Fowler (2012) have argued that it could be ontogenetic, but these are vertebrae from the most deeply bifurcated region of a diplodocid neck, in a decent sized animal, and there is nothing that so much as hints at bifurcation. That whacking great ligament scar running right down the back (and also the front, not pictured) of the neural spine. There is nothing like this in any diplodocid — neither on the metapophyses nor running though the trough. And remember, scars like these tend to become more prominent through ontogeny. The neural arch (i.e. the region between the postzygapophyses and the centrum) is taller in Haplocanthosaurus — much taller in the case of C15. The plates running out to the diapophyses are less dorsoventrally expanded in Haplocanthosaurus. The centrum is smaller as a proportion of total height — especially, much smaller than in Diplodocus. The parapophyses extend directly laterally rather than ventrolaterally (hence the position of the cervical ribs level with the bottom of the centrum). 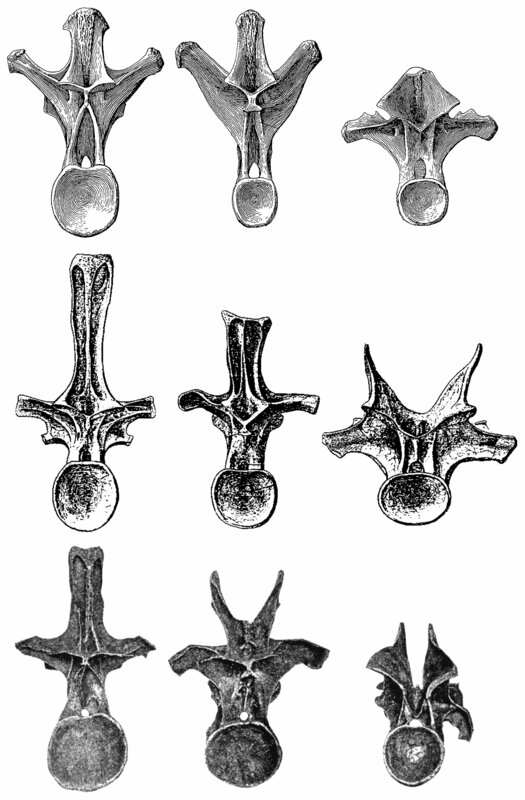 Posterior, mid and anterior dorsal vertebrae, in right lateral view, of (top to bottom), Haplocanthosaurus, Apatosaurus louisae CM 3018 (from Gilmore 1936:plate XXV, reversed for ease of comparison) and Diplodocus carnegii CM 84 (from Hatcher 1901:plate VII), scaled to roughly the same size. For the diplodocids, we illustrate D9, D5 and D2. For Haplocanthosaurus, which has four more dorsals, we illustrate D13 and D7 of H. priscus (from Hatcher 1903:plate I) and D2 of H. utterbacki (from plate II). Here we see that Haplocanthosaurus has dorsolaterally inclined diapophyses (which we’ll see more clearly in a minute), a prominent spinodiapohyseal lamina in posterior dorsals, and no infraparapophyseal lamination. Also, the dorsal vertebrae have reached their full height by the middle of the series (in fact the last nine dorsals are startlingly similar in proportions), whereas in diplodocids, total height continues to increase posteriorly. 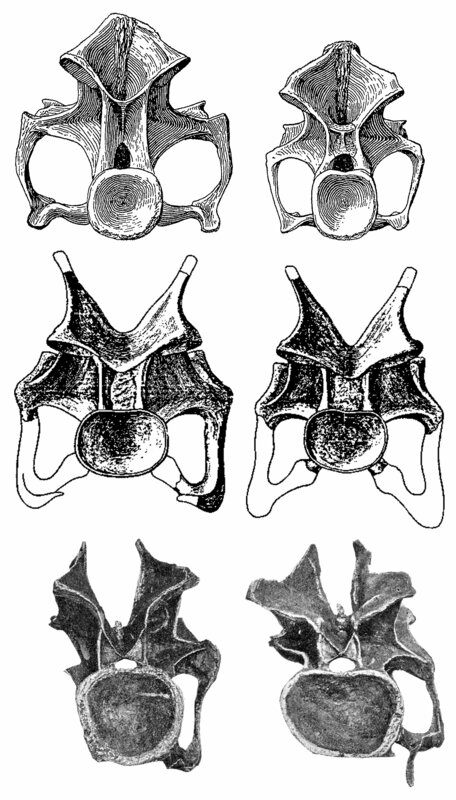 Posterior, mid and anterior dorsal vertebrae, in posterior view, of (top to bottom), Haplocanthosaurus priscus CM 572 (From Hatcher 1903:plate I), Apatosaurus louisae CM 3018 (from Gilmore 1936:plate XXV) and Diplodocus carnegii CM 84 (from Hatcher 1901:plate VII), scaled to the same height of the mid dorsal. For the diplodocids, we illustrate D9, D5 and D1. For Haplocanthosaurus, which has four more dorsals, we illustrate D13, D6 and D1. Of course we have the non-bifid spine in again, in the anterior dorsal, but let’s not keep flogging that dead horse. In the mid and posterior dorsals, the neurapophysis is rounded in posterior view rather than square. In the posterior dorsal, the neural spine has laterally directed triangular processes near the top. All three Haplocanthosaurus neural spines have broad, rugose ligament scars, whereas those of the diplodocids have narrow postspinal laminae. The neural arches (measured from the centrum up to the diapophyses) are much taller. The diapophyses have distinct club-like rugosities at their tips. The hyposphenes of mid and posterior dorsals have very long centropostzygapophyseal laminae curving up in a gentle arch. The centra are smaller than those of Apatosaurus, and much smaller than those of Diplodocus. So based on the vertebrae alone, the case of Haplocanthosaurus as an immature form of Diplodocus or Apatosaurus is blown right out of the water. And this is without even looking at the appendicular material — for example, the scapula and coracoid illustrated by Hatcher (1903:figs 17-19), which are so completely different from those of diplodocids. But there’s more. Tune in next time for the rest. Part 4: is Suuwassea a juvenile of a known diplodocid? Part 5: is Haplocanthosaurus a juvenile of a known diplodocid? Gillette, D.D. 1991. Seismosaurus halli, gen. et sp. nov., a new sauropod dinosaur from the Morrison Formation (Upper Jurassic/Lower Cretaceous) of New Mexico, USA. Journal of Vertebrate Paleontology 11(4):417-433. Lovelace, D.M., Hartman, S.A., Wahl, W.R. 2008. Morphology of a specimen of Supersaurus (Dinosauria, Sauropoda) from the Morrison Formation of Wyoming, and a re-evaluation of diplodocid phylogeny. Arquivos do Museu Nacional, Rio de Janeiro 65(4):527-544. Lucas, S.G., Spielmann, J.A., Rinehart, L.F., Heckert, A.B., Herne, M.C., Hunt, A.P., Foster, J.R., Sullivan, R.M. 2006, Taxonomic status of Seismosaurus hallorum, a Late Jurassic sauropod dinosaur from New Mexico. New Mexico Museum of Natural History and Science Bulletin 36:149-162. Upchurch, P. Barrett, P.M., Dodson, P. 2004. Sauropoda. pp. 259-322 in D.B. Weishampel, P. Dodson and H. Osmólska (eds. ), The Dinosauria, 2nd edition. University of California Press, Berkeley and Los Angeles. 861 pp. Wilson, J.A. 2002. Sauropod dinosaur phylogeny: critique and cladistic analysis. Zoological Journal of the Linnean Society 136:217-276. I composited the cervical and dorsal series above into the following compound illustrations. As always, click through for full resolution. 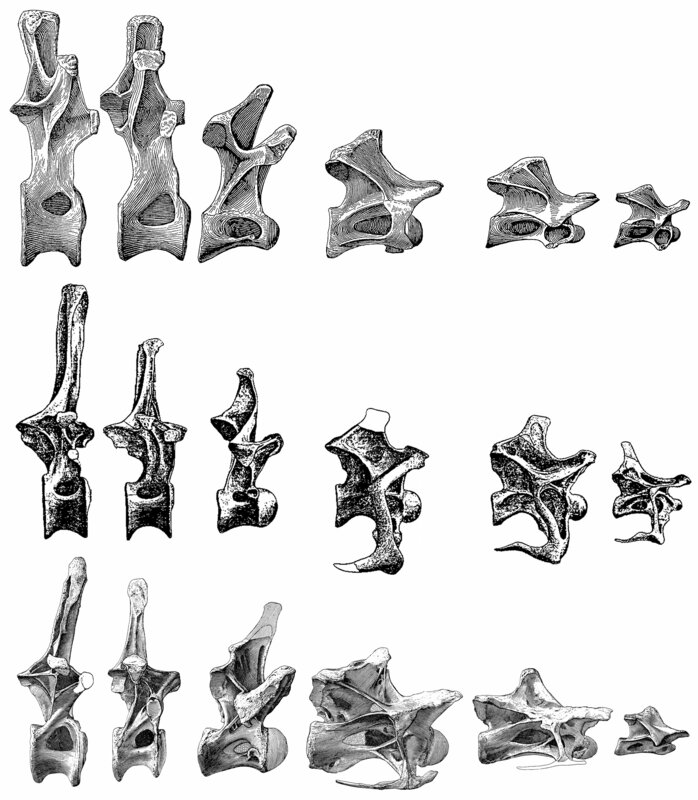 Posterior, mid and anterior dorsal vertebrae and cervical vertebrae, in right lateral view, of (top to bottom), Haplocanthosaurus, Apatosaurus louisae CM 3018 (from Gilmore 1936:plates XXIV and XXV, reversed for ease of comparison) and Diplodocus carnegii CM 84 (from Hatcher 1901:plates III and VII), scaled to roughly the same size. For the diplodocids, we illustrate D9, D5, D2, C13, C9 and C4. For Haplocanthosaurus, which has four more dorsals, we illustrate D13, D7 and C14 of H. priscus (from Hatcher 1903:plate I) and D2, C9 and C4 of H. utterbacki (from plate II). 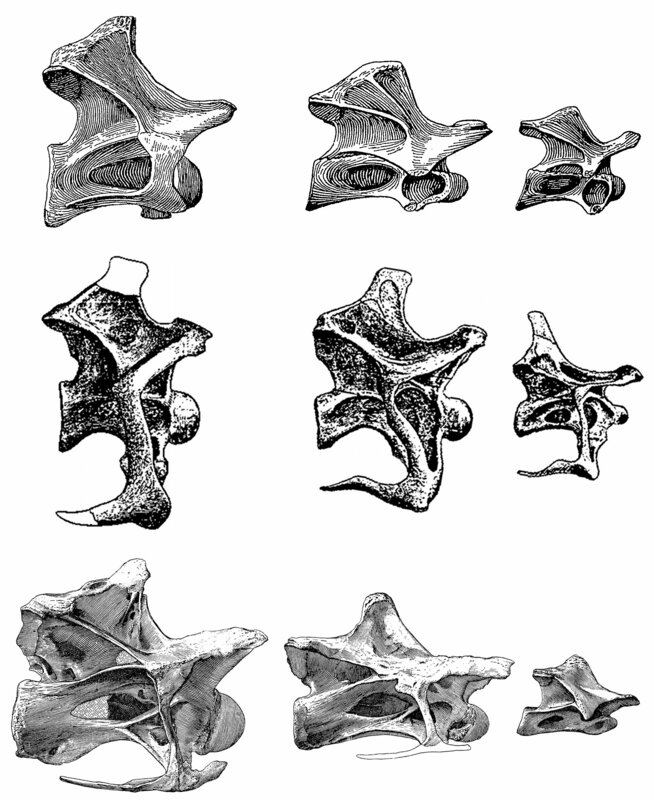 Posterior, mid and anterior dorsal vertebrae and posterior cervical vertebrae C15 and C14, in posterior view, of (top to bottom), Haplocanthosaurus priscus CM 572 (From Hatcher 1903:plate I), Apatosaurus louisae CM 3018 (from Gilmore 1936:plates XXIV and XXV) and Diplodocus carnegii CM 84 (from Hatcher 1901:plates III and VII), scaled to the same height of the mid dorsal. For the diplodocids, we illustrate D9, D5 and D1. For Haplocanthosaurus, which has four more dorsals, we illustrate D13, D6 and D1. And presumably H. delfsi also differs dramatically from Apatosaurus and Diplodocus; but given its much larger size does it’s differences from H. priscus and H. utterbacki say anything interesting about the ontogenetic tragectory in Haplocanthosaurus? On the ontogenetic trajectory of Haplocanthosaurus: all will be revealed in the next post. Sorry to be a tease, but it’s already written and ready to go, so I don’t want to pre-empt it.